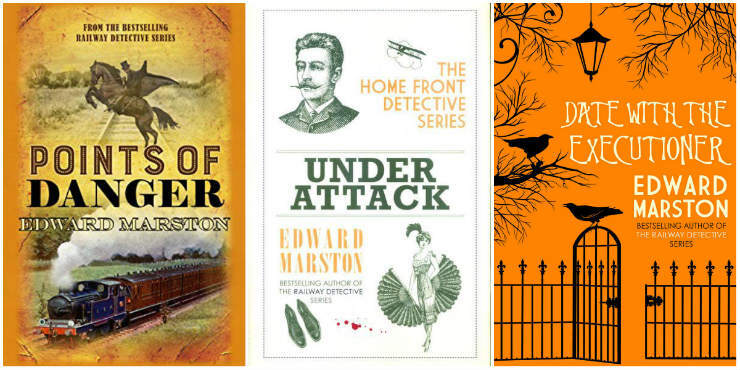 Edward Marston is the author of sixty crime novels, set in seven distinct periods of history. His books have been translated into many languages. His first historical mystery, The Queen’s Head , was published in 1988, launching the Nicholas Bracewell series. Edward’s latest book, Points of Danger , is part of his Railway Detective series. Charles Dickens and Robert Louis Stevenson were early influences but, as a teenager, my favourite authors were Bernard Shaw and P. G. Wodehouse, two masters of the English language who were still turning out quality work in their nineties. 2. How did Nicholas Bracewell come about and when did you realise he was a character you could develop? I was always fascinated by Elizabethan and Jacobean drama. Plays of that period attracted every element in society, from members of the aristocracy to lowly apprentices. In Nicholas Bracewell, I had a hero who was harrying the actors one minute then conversing with Lord Westfield, their patron, the next. As book holder in a theatre company, Nicholas has a pivotal role. From the start I thought of him as a man with the stamina and resourcefulness to hold a series of novels together. 3. Points of Danger , is set in East Anglia in 1861. What was it like to write and did it involve a lot of research? Points of Danger was fun to write but did involve a lot of research. In 1861 there were several rival railway companies in East Anglia and a desperate need for someone to unify them and improve their woeful record. What would happen, I wondered, if the man most likely to bring together the various companies was murdered? I come from a railway family and have always loved steam locomotives. For our wedding anniversary, my wife and I once had a day at Didcot, taking it in turns to drive a locomotive that was built in 1916 but was still in excellent condition. 4. When you read a mystery story by another writer, can you enjoy it as a reader or are you always thinking ‘I can see what you have done there’? I judge every crime novel on its own merits and never try to guess what the author is up to. There’s great pleasure in being caught up in a thrilling narrative. 5. You have written over 100 books now, including non-fiction. Where is the best place for a new reader to start with your work? The first book in the Nicholas Bracewell series ( The Queen’s Head ) and the first in the Colbeck series ( The Railway Detective ). Fight hard to save your library. It’s a vital public asset. I acted in the Turkish premiere of Harold Pinter’s play, The Caretaker , in Istanbul.